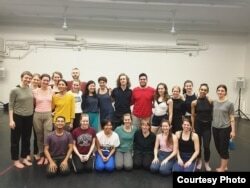 Cambodian classical dancer, Nget Rady, is now in New York City, doing focused research on contemporary dance moves, thanks to the support of the Asian Cultural Council, whose mission is to enhance international respect and understanding between people and cultures through transformative cultural exchanges. He was the only Cambodian artist to be awarded a scholarship to take intensive courses for six months in New York. During his two-week stay in the U.S., Rady Nget has performed and directed his own contemporary dance, called “My Memory”, depicting his childhood at Judson Memorial Church, in front of more than 200 people. He has also participated in many performances to observe different kinds of dance movements and techniques. He first began his dancing classes in 1999, specializing in Lakon Khaol, a masked dance theater re-enactment of the Buddhist epic Reamker, at the Secondary School of Fine Arts. After he finished grade 12, he almost gave up on his classical dancing journey due to his family’s financial problems. “My mother was a CINTRI worker. Sometimes, I helped her clean rubbish near the Royal University of Fine Arts. However, I didn’t notice the school until I got to study there. It was surprising and unbelievable at the same time,” he said, referring to the company that has the waste disposal contract in Phnom Penh. Fortunately, in 2009, he was offered a chance by choreographer Soy Chankethya to perform contemporary dance for the first time, at the Chenla Theatre. He realized he liked the dances even more. With encouragement from friends and lecturers, he decided to pursue his journey in classical and contemporary dancing. During his bachelor degree, he was also a part-time dance teacher in order to make some money to support his daily expenses. He has also participated in various contemporary dance workshops from both local and international trainers. Showing steely resolve, Rady managed to graduate in Choreography at RUFA in 2013. He is now working as an officer at RUFA and a classical dancer at Amrita Performing Arts. This young dancer has traveled to Europe to perform contemporary dance he has traveled to Europe and throughout Asia to perform Khmer classical dancing. It is his second time in the United States. In 2013, together with 125 other Cambodian artists, he performed in New York City, in a program called “Season of Cambodia”. Looking to the future, Rady aspires to be a dancing lecturer at RUFA and a professional choreographer, directing his own dances. Chey Chankethya, another colleague of Rady at Amrita Performing Arts, said that Rady deserved the grant scholarship because of his talent, hard work and generosity in helping people.